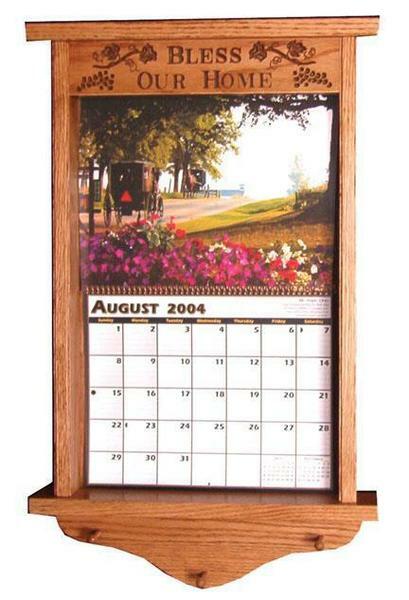 The Amish Hardwood Carved Calendar Frame makes a lovely display in your kitchen or hallway. Showcase your wall calendar in a lovely solid wood frame. This Amish made frame displays the phrase "Bless Our Home" at the top. The Large Hardwood Carved Calendar Frame holds a 13" x 24" calendar, while the Small Hardwood Carved Calendar Frame holds a 12" x 19" calendar. Prevent torn and curled pages and keep your calendar where it is convenient. Please call us with any questions, toll-free at 866-272-6773. Large: 17.25" x 3" x 31.5"
Small: 16" x 3" x 26"